With many in-house modules on homepage such as SJ Video Box or SJ Gallery Pro, any blocks can be utilized to show valuable content. Custom pages such as about us, gallery portfolio, video or sitemap… make Financial highly customized. Beside default Content component, this template offers you K2 for specific need. For developers, by using improved YT Framework, many options including but not limited to: colors, menus, typography, short-codes can be configured quickly to suit any customization. Another YT Framework-based template. Framework updated with short-codes, sticky positions and improved UI allows you to meet modern standards of Web technologies. Specially, this is compatible with Auto Updater component of Joomla! to update framework any time to latest version from our repository. The template is designed for financial related sites. Therefore, it is equipped with K2 component which powerfully supports this kind of template. SJ Financial supports from 1 to 4 columns for K2 listing. In the K2 list, each item will be present with date, title, brief description, “read more” link and tags. It’s very convenient for visitors. The template provides 6 different Preset Color Styles: Tomato (default), Red, Cyan, Green, Dark Blue and DarkRed . Just pick up the favourite one. Besides, it absolutely allows you to control color schemes and other parameters in back-end. You can change Theme Styles, Layouts, Menus, Typography and Reset instantly through a standard web browser… by using c-Panel. Catch up with new trend of web design, all new SmartAddons templates are designed with full responsive. For this feature, you can surf your website in any devices from PC to portable devices: laptop, smartphone, tablet… without any web layout quality changing. 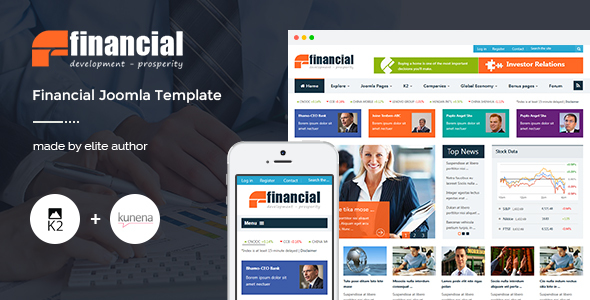 SJ Financial supports 4 types of menu: Mega Menu, Css Menu, Moo Menu and Drop Down Menu. With our Mega menu, you can add a multi-category, multi-article with description, price, image, video, effects… or even modules. Our design brings you a wonderful feature – Powerful Slideshow, that help you to highlight your recommended items. These items will be presented with necessary information: images, titles, brief descriptions, detail link upon nice effects. Constantly, SJ Financial is equipped with Video box feature. It’s a very cool way to present your information through a simple way. As a multilingual template, SJ Financial also supports RTL (Right to Left) Language based designs like Arabic, Farsi & Hebrew….